The Ghaed Bassir Petrochemical Plant is located in Golpayegan Iran. According to the company’s official website, it produces ABS (Acrylonitrile Butadiene Styrene) and SAN (Styrene Acrylonitrile Copolymer) resins. The Environment section of Ghaeed Bassir’s official website says that the company has “established an environment conscious management based on the philosophy that says the environment comes before business”, adding that they “strictly control the production units from disposing of waste”. And yet according to a report by IRNA state-run News Agency, the people living in the surrounding villages around the plant have lost everything. Their village which was once known for its natural springs and sparkling water, is now barren. The people have lost their agriculture and the land is no longer productive. The report goes on to say that the Ghaed Bassir Petrochemical Plant had dug more than 200 deep water wells sucking out all the water in the area and causing an environmental disaster. According to the villagers interviewed in the report, their water is contaminated and the smoke from the Plant has robbed them of clean air. The factory’s sewage system is right next to the village’s drinking water source. Toxins have found their way into the water which has resulted in the many cases of cancer among the villagers. IRNA said that the Ghaed Bassir Company was not willing to answer questions about the allegations with a representative from the CEO’s office saying “we don’t have permission to talk”. It’s interesting to note that the Ghaed Bassir Company is owned by the Tadbir Energy Development Group, overseen by Tadbir Economic Development Group, which is controlled by the Execution of Imam Khomeini’s Order (EIKO) or “Setad” which in turn is overseen by Iran’s Supreme Leader himself. In fact, according to a Reuters investigation, titled “Khamenei controls massive financial empire built on property seizures”, the Setad has become “one of the most powerful organizations in Iran, and has morphed into a business juggernaut that now holds stakes in nearly every sector of Iranian industry, including finance, oil, telecommunications, the production of birth-control pills and even ostrich farming”. “The organization’s total worth is difficult to pinpoint because of the secrecy of its accounts. But Setad’s holdings of real estate, corporate stakes and other assets total about $95 billion, Reuters has calculated”. 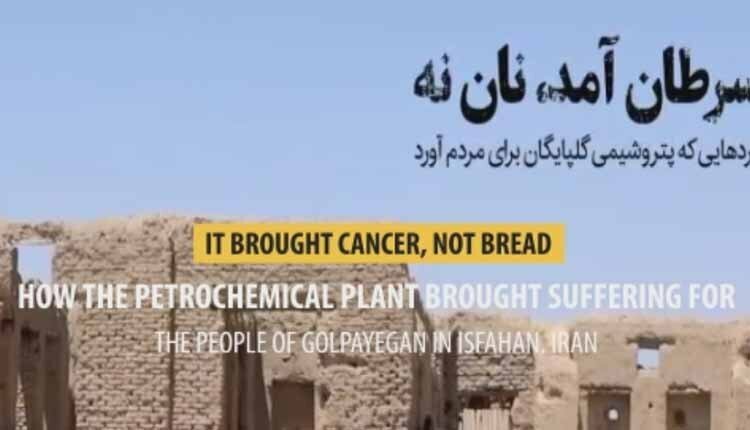 The report shows that the government of Iran is responsible for yet another environmental crisis which has led to many cancer related deaths and hardships for people in Golpayegan, Isfahan. Reporter: The only sound that can be heard, is that of dogs from the historical villages of Golpayegan which was once filled with the commotion of the people living there. A people that have not been happy in 21 years. It was in 1997 that the first structure for the Petrochemical Plant was built in Golpayegan, a few steps away from the villages of Estahlak, Gharqab, Faraj Abad, Dizi Jan and a number of other villages. Voice of man: They have acquired a license in this desert and have prevented the people from doing agriculture. And no one follows this up. Reporter: Now after 21 years, the village which once had agricultural products, beekeeping and sparkling water and was known for its lush greenery has lost everything. Voice of elderly man: The village’s drinking water, if you want to make tea with it, tastes funny. A lot of people provide water from outside. Reporter: It was not divine wrath or drought that has dried up all the water. It was the digging of more than 200 deep water wells for the petrochemical plant. Elderly woman: I was here at the time. A water pipe that went through our yard, they wouldn’t let us use any of it. We have to drink contaminated water. The petrochemical plant has lots of smoke. At nights, we can’t lie down or sit. When you close the doors it gets too hot. When you open them, the smoke comes into the house. I was sitting here last night and I was about to suffocate from the smoke. Elderly man: We had the best fruits, best potatoes and vegetables. But when they built the petrochemical plant, the drought started and got worse every year. Reporter: The factory’s sewage is next to the people’s water supply. It has created a cavity in the ground full of toxic waste. The toxins trickle into the underground water and has brought nothing for the people except cancer. Woman: Mr. Ismail Beigi, come and talk about the toxins from the petrochemical plant. Ismail Beigi: You can ask how many people have gotten cancer in this villages. Only in the past 5-6 years. There is evidence for it all. Right now, there are two or three people here with cancer. Man: My father had cancer, my mother had cancer, my brother’s child and my other brother all had cancer. My father in law and my aunt they all got cancer in the past 4-5 years. Ismail Beigi: My father has cancer. Her husband died from cancer. That other lady’s husband also died. Woman: I take him to Arak for chemotherapy despite the little money we have. We don’t have any source of income. Elderly woman: My husband got sick. He got cancer and passed away. After him, I got cancer and I’ve been under treatment for two years now. I go to and fro from the hospital. Woman: If they gave us money, not only to me, but to people like me, that would have been good. But unfortunately no one listens. Authorities don’t listen, no one listens to us. Reporter: Ma’am I talked to him (the CEO) today and he said that we have not right to talk to news agencies. Ghaem Bassir Office: If he said that, then whatever he said is right. We don’t have the permission. Ghaem Bassir Office: We have our reasons. Ismail Beigi: They promised they would give us free gas from the petrochemical plant and that water and even electricity would be given to us from the plant. But since its inception, unfortunately, all the promises were forgotten. They also told us that they would use the work force from our region but didn’t even employ one person from here and they brought employees from other places and provinces. Elderly woman: My son is unemployed. He’s 30 and sits in the house. I sent him to university in Kashan but he’s unemployed and just sits in the house. Elderly man: It has led to employment for those who are, as they say, “involved” or are higher or know people in high places. Young man: We have to breathe in all the smoke and toxins from the factory but they won’t employ us. I’ve personally gone there three time. My brother was killed in the war. I got a letter from the Martyrs Foundation. I went all the way to Tehran but no one followed up my employment. I didn’t want to do anything important. I just wanted to work as a laborer but they said they didn’t need anyone. What can we do? I bought two cows that I make a living off. Reporter: This is a polluting industry that makes disposable products and answers to no one. Reporter: Does that mean that your company is above being held accountable by a reporter? Ghaem Bassir Office: He won’t answer. They probably have orders. A law that says he can’t. Reporter: So you set the rules? Because we were told to call the Office. Ghaem Bassir Office: No dear, he won’t do an interview. Under no circumstances. Reporter: Why won’t he do the interview? Ghaem Bassir Office: He just won’t. Ghaem Bassir Office: The CEO will not do the interview. Under no circumstance and with no media. Reporter: Because I’m not convinced. Ghaem Bassir Office: Well, the reasons are known to our company.